During the summer of 2013, First Baptist Church reaffirmed a commitment to relocate from our current downtown facilities to another area of the city. In 2014, FBC purchased 33 acres on South Market street near 290 and across from the Tractor Supply store. Fall 2014: The Relocation Committee is meeting to begin discerning about the design and construction process they want to present to the church. This includes times of prayer and discussion as a committee and listening to presentations from architecture and construction firms. February 2015: At the end of February, the Relocation Committee will have met with seven architects and two construction firms. After the meeting with the seventh architecture firm at the end of the month, the committee will meet to discern whether or not to meet with more architecture firms or whether to recommend one of the firms already interviewed to the church. March 2015: The Relocation Committee, through prayer and reflection, has narrowed the search down to two architecture firms. The committee will be meeting with both firms for another round of conversations in order to discern whether one of these firms is the one to recommend to the church. December 2015: The Relocation Committee recommended CMA Architects out of Dallas, TX (http://www.cmarch.com/) to do our master plan, and the church approved the recommendation on December 6, 2015. 2016: The church approved Goff Companies to oversee the construction side of our relocation. You can learn more about Goff Companies by clicking here: http://goffcompanies.com/. November 13, 2016: The Relocation Committee presented a rough draft of a proposed Master Plan in a meeting in order to receive input from the church. A summary of this input meeting can be found here: Summary of November 13, 2016. February 19, 2017: In a special meeting at the end of each of the Sunday morning worship services, the church voted to approve the Master Plan. 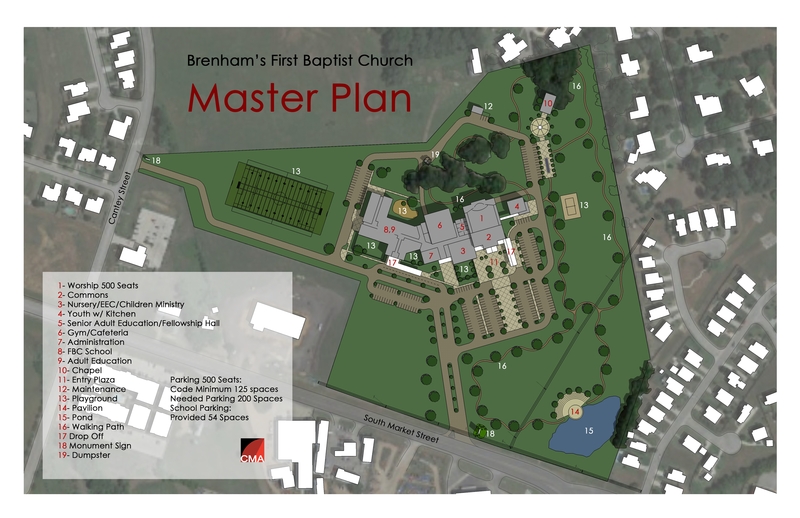 A copy of the plan can be found by clicking here: Brenham's FBC Master Plan. April 23, 2017: There was a church-wide input session on an initial first phase block floor plan. This is only an initial plan and changes will be made to it. A summary of this input meeting can be found here: Summary of April 23, 2017. June 4, 2017: In a special meeting at the end of each of the Sunday morning worship services, the church voted and approved the Phase One Floor Plan, which can be viewed here: Phase One Floor Plan.